I’ve previously explained why I don’t have a dog in the current shutdown fight in Washington. Simply stated, Trump isn’t fighting to make government smaller. Instead he wants more spending for a wall and isn’t even proposing some offsetting reductions to keep the overall burden of government from expanding. That being said, I get annoyed when defenders of the status quo act as if the economy is in danger simply because a small handful of non-essential bureaucracies and departments are temporarily shuttered. In addition to the interview with Fox Business, I also pontificated on the same topic for Cheddar, which is a new network covering financial and economic issues. So why are TV networks bothering to cover this non-story? 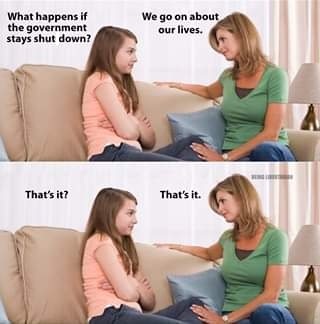 Because some people think the partial shutdown does matter. Here are some excerpts from a report by USA Today. Economists are starting to weigh the potential damage of the ongoing federal government shutdown…if the impasse drags into late January or beyond, it could take a noticeable toll by dampening federal workers’ productivity, temporarily halting their paychecks… The biggest damage could be inflicted on consumer and business confidence that’s already been dented by the recent stock market selloff. …Economist Jesse Edgerton of JPMorgan Chase predicts it could trim growth by a half a percentage point. That’s about how much the 16-day partial government shutdown reduced growth in late 2013. The people who made up numbers about the alleged harm of the 2013 shutdown are basically the same people who said the sequester would hurt growth. They were wrong then and they are wrong now. You use a crummy Keynesian model (which presupposes that government spending is good for the economy) and you get predictably nonsensical Keynesian results. Writing for the American Spectator, Christopher Buskirk has a more sober perspective. The DC media complex is not happy with the partial shutdown of the federal government. The government shutdown drags into the New Year, they tell us! 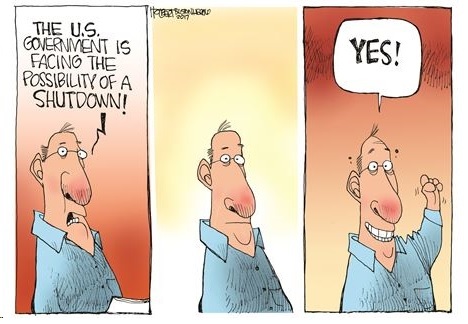 …Yet for all of the breathless commentary from Beltway media, the reality is that the federal government can’t even shut itself down properly. Only about 25 percent of the federal government is affected. The military is fully funded and on duty, as are Social Security and Medicare. The US Postal Services continues delivering unwanted flyers and coupons, the TSA is fully funded and patting people down, and the Veterans Administration is still providing substandard care to our veterans. …when I turn on the faucet, water still comes out. When I drive to the store, the street lights are still on. In fact, I passed a police officer on the way to get a coffee this morning, so our neighborhood remains safe. So what am I missing? Not much it turns out. And neither is almost anyone else. 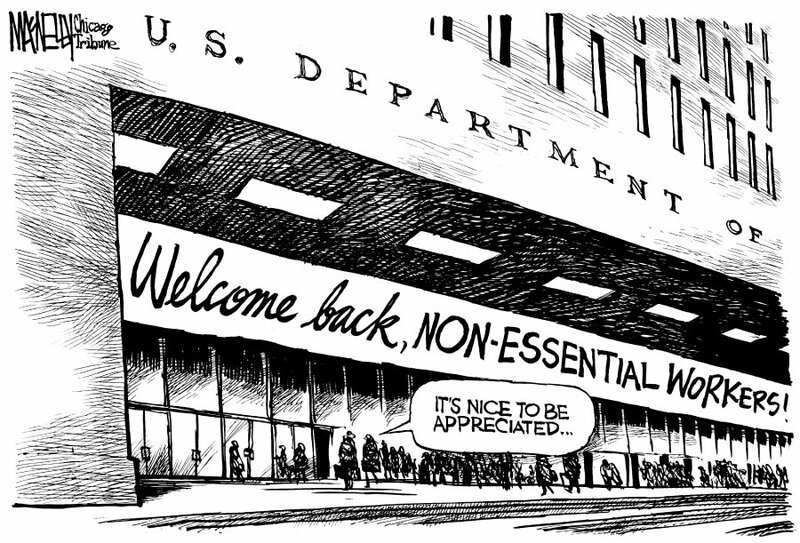 …what we learned from the shutdown is that…the federal government is mostly non-essential. 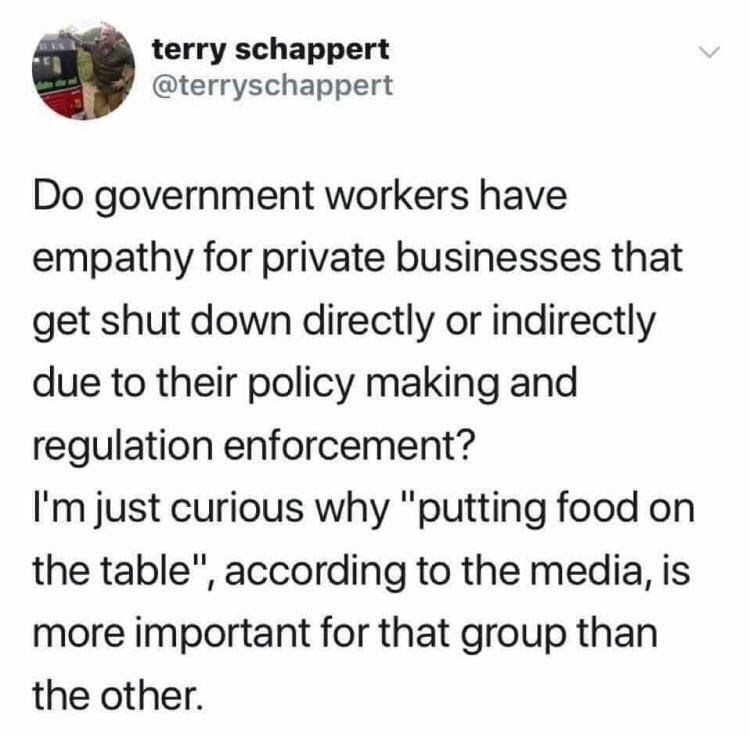 This is one of the reasons I don’t get agitated about shutdown (at least the ones that occur because someone is fighting for good policy). If we kept parts of the government shut down for a long period of time, maybe people would notice that nothing bad happened and then conclude that it would be a good idea to never let those departments and agencies reopen. In any event, the focus of fiscal policy should be on shrinking the federal government, not merely a temporary partial shutdown (which doesn’t even save money since bureaucrats eventually get full pay for the days they weren’t in their offices). Let’s close with a bit of humor I received in my inbox. You can see other examples of shutdown satire by clicking here. P.S. As I noted in my interview, the current shakiness of financial markets should be blamed on Trump’s protectionism and the hangover from Keynesian monetary policy. In this interview with Dana Loesch, I make several points about the Trump budget, including the need to reform means-tested entitlements and Obamacare (with a caveat from my Second Theorem of government), as well as some comments on foreign aid and fake budget cuts. Simply stated, while he can’t force Congress to enact a bill that reforms entitlements, his veto power means he can stop Congress from appropriating more money that he wants to spend. But if he wants to win that battle, he needs to be willing to allow a partial government shutdown. Which he wasn’t willing to let happen when he approved a bad deal a few weeks ago to fund the government for the rest of the 2017 fiscal year. But we have some good news. He may have learned from that mistake, at least if we take this tweet seriously. Amen. Trump should be firm and explicitly warn Congress that he will veto any appropriations bill that spends one penny above what he requested in his budget. And if Congress doesn’t comply, he should use his veto pen and we’ll have a partial shutdown, which basically effects the “non-essential” parts of the federal government that presumably shouldn’t be funded anyhow. The only way Trump loses that fight is if enough Republicans join with Democrats to override his veto. 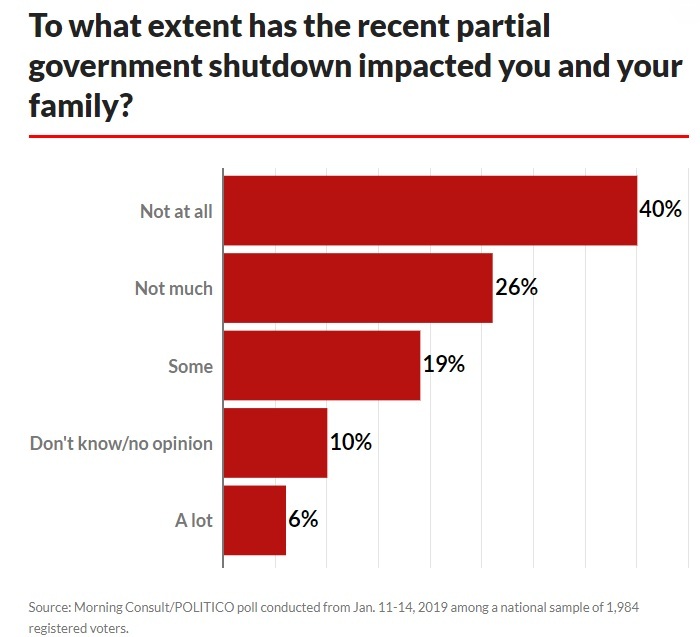 But that’s unlikely since it is mostly Democrat constituencies (government bureaucrats and other recipients of taxpayer money) who feel the pinch if there’s a partial shutdown. This is a big reason why, as we saw during the Clinton years, it’s Democrats who begin to cave so long as Republicans don’t preemptively surrender. The bottom line is that being tough on the budget isn’t just good policy. As Ronald Reagan demonstrated, there are political rewards when you shrink the burden of government and enable faster growth. P.S. I’m not convinced that Trump actually wants smaller government, but I hope I’m wrong. This upcoming battle will be very revealing about where he really stands. P.P.S. 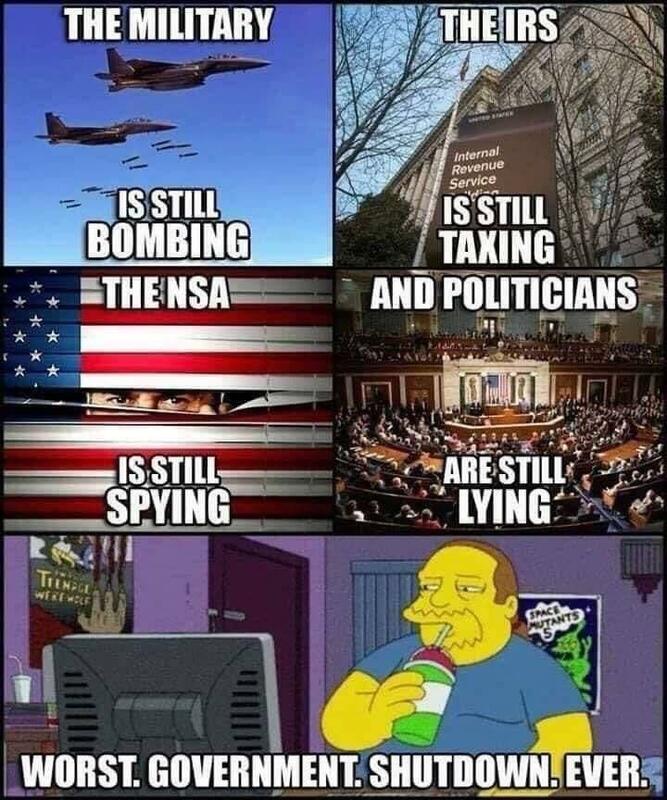 And if we do have a shutdown fight, I hope it will generate some amusing political humor, such as what’s at the bottom of this post. 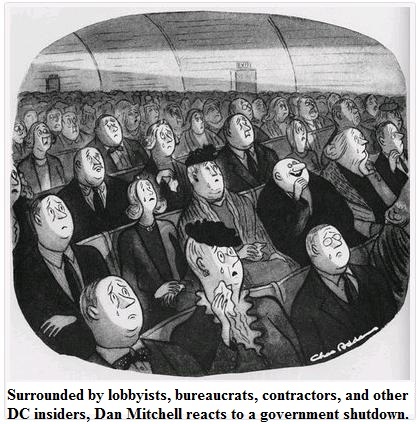 Other examples of shutdown-related humor can be enjoyed by clicking here, here, here, here, and here. Republicans control the House, the Senate, and the White House. In theory, that means a long-overdue opportunity to eliminate wasteful programs and cut pork-barrel spending. In reality, it mostly means business as usual. 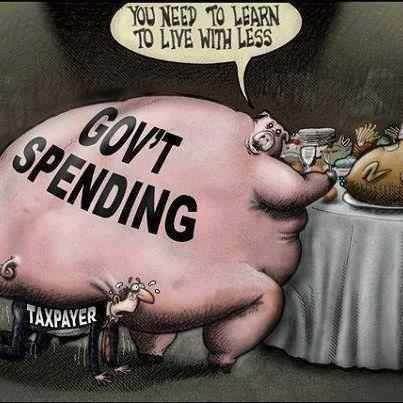 Politicians in Washington just reached a deal to fund the government for the rest of the current fiscal year. As reported by the Washington Post, it’s not exactly a victory for libertarians or small-government conservatives. I guess you could call this a triumph of “public choice” over campaign rhetoric. Politicians did what’s in the best interest of politicians rather than what would be best for the nation. I’m disappointed, as you might expect. But as I say in this interview, there are far more important battles. I’ll gladly accept a bit of pork and profligacy in the 2017 budget if that clears the decks for much-needed repeal of Obamacare and long-overdue reform of the tax code. But here’s the catch. I don’t expect that these reforms will actually happen. Yes, the deck has been cleared, but I don’t think Republicans will take advantage of the opportunity. The fundamental problem, which I pointed out in a different interview, is that there’s not a governing majority for smaller government. And that has some very grim implications. Even more depressing, I point out that only Trump has the power to turn things around. Yet I see very little evidence that he, a) believes in smaller government, or b) is willing to expend any political capital to achieve smaller government. To make matters worse, Republicans have convinced themselves that they lose the spin battle whenever there is a shutdown or some other high-stakes fiscal fight with Democrats. For what it’s worth, I’m trying to remind Republicans that it is in their long-run political interests to do the right thing (as Reagan demonstrated). That’s why, in the first interview, I said they need to gut Obamacare and lower taxes if they want to do well in the 2018 and 2020 elections. But don’t hold your breath waiting for the “stupid party” to behave intelligently. Does Donald Trump Believe in Smaller Government and More Freedom? Does Donald Trump have a consistent and coherent set of economic policies? He sometimes says things indicating that he understands Washington is a cesspool of waste. But on other occasions, he seems to be singing off the same song sheet as Bernie Sanders. Which is why, when I recently tried to dissect Trumponomics, I admitted to being clueless. The honest answer is that I don’t know. He has put forth a giant tax cut that is reasonably well designed, so that implies more prosperity, but is he serious about the plan? And does he have a plan for the concomitant spending reforms needed to make his tax proposal viable? He also has lots of protectionist rhetoric, including a proposal for a 45 percent tax on Chinese products, which implies harmful dislocation to the American economy. Is he actually serious about risking a global trade war, or is his saber rattling just a negotiating tool, as some of his defenders claim? For what it’s worth, I’m getting more skeptical that Trump would try to restrain and limit the federal government if he got elected. And I have three recent news reports to underscore my concern. Here’s a very disturbing example. Trump actually criticized Governor Scott Walker of Wisconsin for not raising taxes. Here’s an excerpt from a report in the U.K.-based Guardian. To dig deeper into the issue, Governor Walker had just endorsed Ted Cruz, so I can understand why Trump would try to take a few shots at someone who is supporting a rival for the GOP nomination. But attacking the Wisconsin governor for successfully balancing his state’s budget without a tax hike? Sounds more like something Hillary would say. Maybe it’s time to induct Trump into the Charlie Brown Club. Trump also doesn’t like federalism. Assuming he even knows what it is. In his column for the Washington Post, Professor Jonathan Adler shares some Q&A from a recent CNN interview with Trump. TRUMP: Well, the greatest function of all by far is security for our nation. I would also say health care, I would also say education. This doesn’t sound like a candidate who wants to reduce the federal government’s footprint. Here’s more of the interview. Huh, providing “great neighborhoods” is now a legitimate function of the federal government?!? I guess if Washington gets to be involved with underwear, neighborhood policy is just fine. And why is he talking about education when the goal should be to eliminate the Department of Education? To be fair, Trump also said in the interview that he wants to get rid of Common Core. So it’s unclear what he actually envisions. His answer on healthcare is similarly hazy. 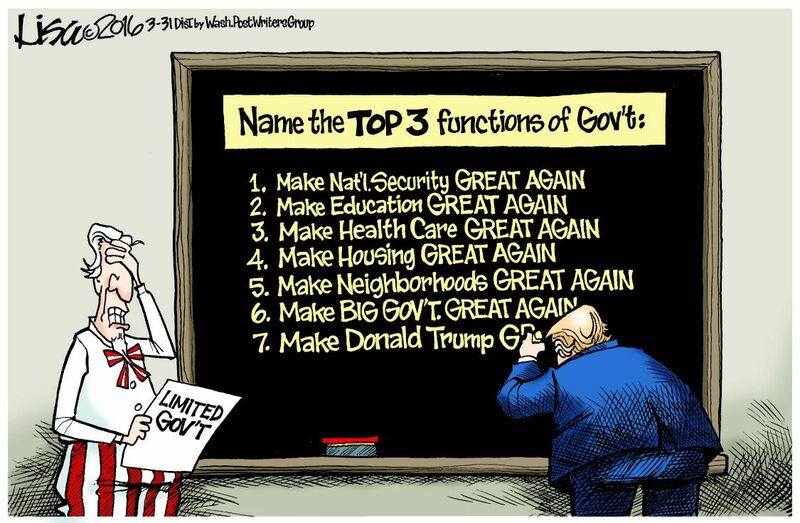 TRUMP: The government can lead it. So he wants the federal government involved, but he also thinks Obamacare is a “disaster.” I certainly agree about the Obamacare part, but once again we’re left with no idea whether a President Trump would make good reforms of bad reforms (i.e., would he move the “health care freedom meter” in the right direction or wrong direction?). One thing that is clear, however, is that Trump doesn’t seem to have any core principles about the size and scope of the federal government. He may not even realize that federalism is a key issue for advocates of limited and constitutional government. Last but not least, Trump criticized Senator Cruz for the partial government shutdown fight that occurred in 2013. Here are some passages from a report by Byron York in the Washington Examiner. When Trump did get around to Cruz, his critique focused…on the 2013 partial government shutdown. …He goes and he stands on the floor of the Senate for a day and a half and he filibusters …. To stand there and to rant and rave for two days and to show people you can filibuster — and in the meantime, nothing was accomplished. I guess this isn’t an issue of underlying principles, but it does give us some idea of whether a President Trump would be willing to fight the Washington establishment. Moreover, his assessment of the shutdown fight is completely wrong. By reminding voters that Republicans were opposed to Obamacare, the GOP won a landslide victory in 2014. But you don’t have to believe me. Even an ultra-establishment, anti-Cruz figure like Trent Lott (former senator and now lobbyist) grudgingly admits that the shutdown was a success. The bottom line is that America is heading in the wrong direction, with Washington projected to consume ever-larger amounts of the economy’s output. 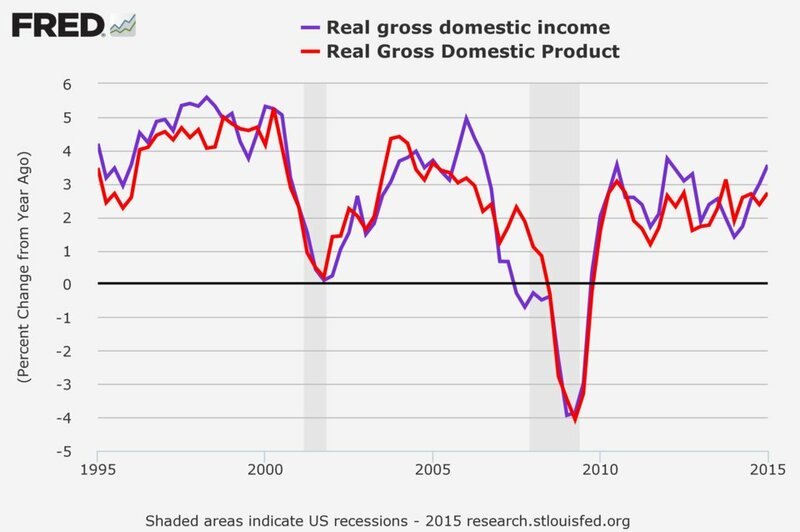 This is a recipe for continued economic weakness in the short run and economic crisis in the long run. Turning policy in the right direction requires a principled President who is fully committed to overcoming resistance from the special interests that dominate Washington’s culture. I still don’t pretend to know where Donald Trump is on the big issues, but I’m not holding my breath for good results if he somehow gets elected. P.S. Though I do expect more examples of clever political humor the longer he’s in the public eye.